The woman accused Avenatti of "forcefully hitting" her in the face with pillows. 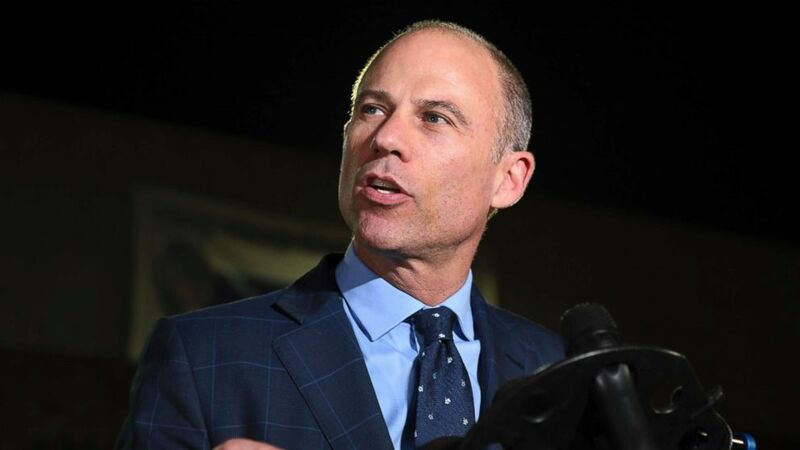 Michael Avenatti, the lawyer for adult film star Stormy Daniels, was allegedly berating his ex-girlfriend about money before an alleged physical altercation in the couple's Southern California home occurred last week, according to court documents file by the ex-girlfriend. Mareli Miniutti, a 24-year-old actress in Los Angeles who says she was in a relationship with Avenatti for more than a year, was granted a temporary restraining order in Los Angeles County Superior Court on Monday. When asked if the allegations aren't true, Avenatti told ABC News' Tom Llamas via text Tuesday afternoon, "I am completely innocent and am anxious for all of the evidence to be disclosed - the video tapes, the Instagram posts, the physical evidence, all of it. I did nothing wrong and certainly did not commit any crime." Miniutti alleges in the court filing that she and Avenatti were in the master bedroom on Nov. 13 when they began arguing about money. Avenatti, 47, allegedly told Miniutti, that she was "ungrateful," calling her a "f------ b----," the court document stated. Miniutti then went to the guest bedroom to sleep, and Avenatti allegedly followed her and approached her in a "threatening manner" before "forcefully hitting" her in the face with pillows, she wrote in her filing. "He then said words to the effect of, 'Do not disrespect me. You don't get to sleep in my house tonight,'" Miniutti wrote. (Mike Blake/Reuters) Michael Avenatti leaves Los Angeles Police Department Pacific Division after being arrested on suspicion of domestic violence, in Culver City, Calif., Nov. 14, 2018. Avenatti then allegedly grabbed her wrist, attempting to pull her out of bed, but he slipped and lost his grip, according to her statements filed with the court. When Miniutti attempted to send a text to a friend, he then allegedly grabbed the phone and screamed, "This is my phone!" and put it in his pocket. "At all times, he remained very close to me such that I was afraid for my safety," Miniutti wrote. After Miniutti "screamed for help towards the nearby window," Avenatti allegedly grabbed her arm, dragged her out of bed onto the floor and through the front door into the public hallway, she said, adding that she suffered scratches to her side and leg. When Miniutti rang a neighbor's doorbell, Avenatti allegedly yelled at her and pulled her back into the apartment, she said. He then allegedly blocked the door with his body to prevent her from leaving. (Michael Owen Baker/AP) Michael Avenatti speaks to the media outside the Los Angeles Police Department Pacific Division after posting bail for a felony domestic violence charge, Nov. 14, 2018. Avenatti then followed Miniutti as she ran back into the guest room, according to Miniutti's court filing. She put on pants but "did not have time to put on shoes," and was able to get around Avenatti, running toward the main elevator. When Avenatti followed her, she pressed the call button for the service elevator, and he allegedly then entered the service elevator with her again, court documents stated. During the ride down to the lobby, Avenatti allegedly begged, "Don't do this, Mareli, don't involved them," her filing stated. Miniutti then spoke to building security and called a friend to pick her up, she said. The next day, she returned to the apartment to pack her belongings, she wrote. Avenatti allegedly came home briefly during that time, but he left after Miniutti informed him that police were at the building, according to the order. Police told Miniutti later that day that Avenatti had been arrested. A letter sent to the LAPD on behalf of Avenatti's attorneys, and obtained by ABC News, detailed efforts by private investigators to interview staff and view security camera footage from the building where the alleged incident took place. According to the letter from Avenatti's defense team, there was no evidence that Avenatti was physically violent with Miniutti. While the apartment complex contained multiple security cameras, at no point do they "show force, violence or offensive touching of Ms. Miniutti by Mr. Avenatti," the letter obtained by ABC News stated. This included video footage in the reception area, elevators, leasing office and foyer of the building, the letter said. While cameras did capture Avenatti and Miniutti together the night of the alleged incident, the videos, according to the document, "conclusively demonstrate that Mr. Avenatti was calm and collected at all relevant times." the letter stated. According to the letter, both a security guard and building concierge, who spoke with investigators hired by Avenatti's attorneys, did not witness Avenatti "use any force or violence against Ms. Miniutti, nor engage in any act of disrespectful or angry touching, nor make any threats, or even any threatening gestures, towards her." Miniutti's attorney, Michael Bachner, told ABC News that she "stands by the accuracy of her statements to the LAPD." "The suggestions contained in Mr. Avenatti’s counsel’s letter to the LAPD are vindictive, demonstrably contrary to the evidence, and unworthy of further reply," Bachner wrote. Miniutti wrote in her filing that she is afraid that Avenatti may "harass" and "cause harm" to her as a result of the events that allegedly occurred on Nov. 13. She also said that Avenatti "has a history of being very verbally abusive and financially controlling towards" her, has "vehemently opposed" to her desire to "earn a living outside of Hollywood," and has "made promises" to take care of her "financially and sometimes fails to follow through," according to the court document. The temporary restraining order request included photos showing what appeared to be bruises on Miniutti's hands and leg. The request was granted on Monday and remains in force until a hearing on Dec. 10. A request to seal the case to avoid a media circus and national scrutiny was denied, as was a request for Avenatti to return an iPhone to Miniutti. The order instructed Avenatti to refrain from harassing, threatening, striking or stalking Miniutti. He is also barred from contacting her or coming within 100 yards of her, her job, her home or her vehicle. After he was arrested on suspicion of domestic violence with injuries last week, Avenatti maintained that he has "never struck a woman." He has not been formally charged with a crime, and the Los Angeles Police Department had not sent the case over to prosecutors for a determination on whether to file formal charges as of Tuesday morning. "I wish to thank the hard working men and woman of the LAPD for their professionalism they were only doing their jobs in light of the completely bogus allegations against me," Avenatti said in a statement released through his law firm last week. "I have never been physically abusive in my life nor was I last night. Any accusations to the contrary are fabricated and meant to do harm to my reputation. I look forward to being fully exonerated." On Tuesday, Avenatti tweeted that he has requested the "immediate release" of the video footage recorded on the date of the alleged incident to his counsel and the Los Angeles Police department to reveal "the truth." He also blasted TMZ, the outlet that broke the news of his arrest, for its "false reporting" about the alleged incident, and threatened to sue them if they do not retract the story and issue an apology. TMZ's initial report indicated that the alleged victim in the incident was Avenatti's estranged wife. The outlet later issued a correction.
.@tmz was presented with conclusive evidence yesterday that their story of last week is completely false. If they do not retract the story and issue an apology, they will be sued. Their conduct is outrageous and they need to be held accountable. Trying to help Trump is no excuse. There is nothing more powerful than video evidence. NOTHING! I will be fully exonerated. Miniutti, a Los-Angeles based actress, is originally from Estonia, records showed. The pair had been dating since October 2017 and moved in together in January, according to her court declaration. Their relationship ended on the night of the alleged incident, Miniutti wrote in her filing. Avenatti's estranged wife, Lisa Storie-Avenatti, who he is in the process of divorcing, and his ex-wife, Christine Avenatti-Carlin, both issued statements after his arrest saying he was never violent with them. Christine Avenatti-Carlin, Avenatti's first wife and mother of his two daughters, said, "Michael has always been a loving, kind father to our two daughters and husband." ABC News' Kaitlyn Folmer, Bill Hutchinson, Casey Gard, Sabina Ghebremedhin, James Hill and Matthew Zarrell contributed to this report.